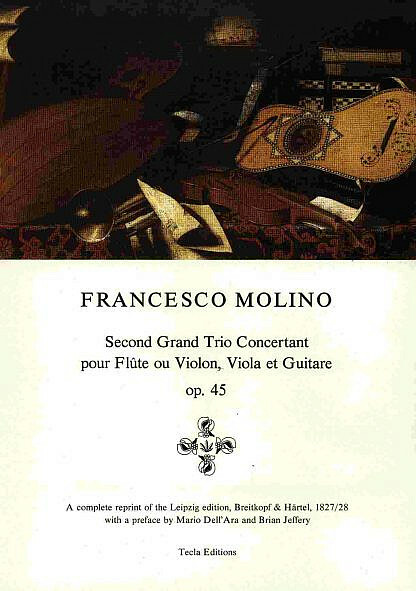 This is a facsimile reprint of the first edition of about 1827/28 of Francesco Molino’s: Second Grand Trio Concertant, op. 45, for flute or violin, viola, and guitar. It is parts only, no score. I first published it in Tecla in 1986. Since then I have made a new re-engraved edition of this same Second Grand Trio Concertant op. 45 of Molino, score and parts, and it is probably that re-engraved edition which will be of use to most performers. Still, if anyone would like to see and use this early original edition, it is here in this edition on this page.